"A finely potted Chinese export hard paste porcelain teabowl and saucer produced for the European market. It is attractively decorated with a Chinese "Lowestoft" pattern of hand painted figures finished with a coloured in wash. The saucer has further carmine cartouches of simple landscapes. 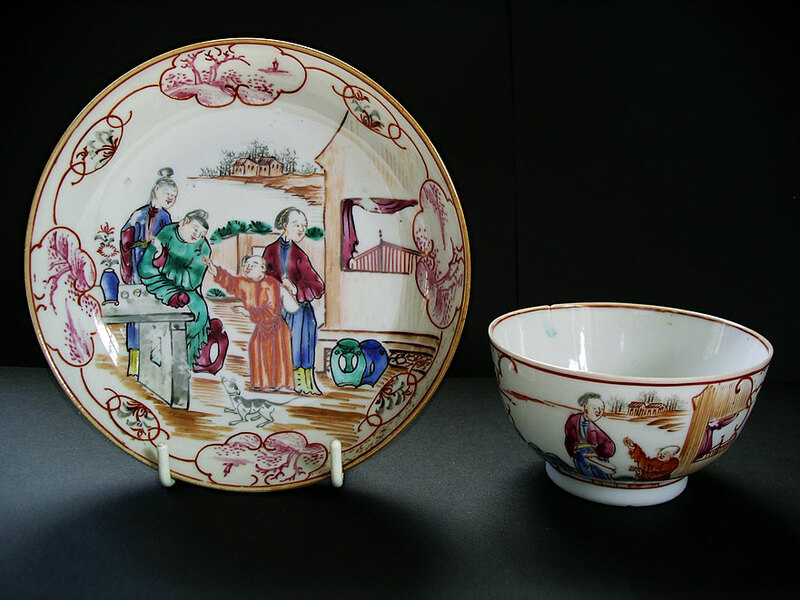 Good collectable Qianlong period Chinese Export Market porcelain teabowl and saucer sets were once commonplace but today are becoming increasingly difficult to find." Antiques Expert Hamilton Bear. References: These and similar Chinese porcelain tea-wares were commonly and incorrectly attributed to the small but significant eighteenth century English Lowestoft porcelain manufactory by nineteenth and earlier twentieth century collectors. It is a style of decoration much imitated by the late eighteenth and early nineteenth century English porcelain makers. Dimensions: width saucer 140 mm max. height teabowl 51 mm max. Condition: A great display item. There is a small flat chip to the rim of the teabowl with associated faint hairline down the side of the bowl. Some rubbing wear to the onglaze polychrome enamels of the saucer. A fine tight glaze hairline extends from saucer edge to footrim at 8.00 o'clock (4.00 o'clock to the reverse). It is faint - just visible in the images. See zoom image 5 teabowl for additional close up view of saucer. Both pieces remain durable, stable and display well.